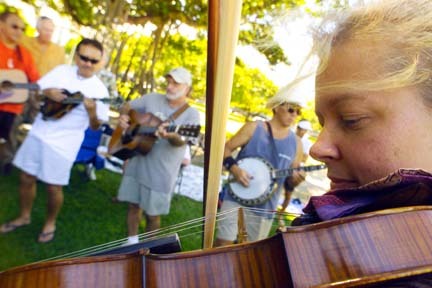 It was a finger-pickin' good time for all at Thomas Square yesterday as bluegrass and acoustic-music lovers and musicians gathered for "Pickin' in the Park," sponsored by Bluegrass Hawaii. Among the performers were bluegrass musicians Osamu Hayakawa, of Punahou; Rene Berthiaume, of Haleiwa; Paul Sato, of Kailua; and Lesley Kline, of Kapahulu. 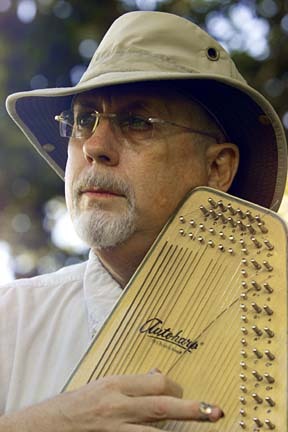 Ken Kipnis, of Moiliili, added his own musical contribution. 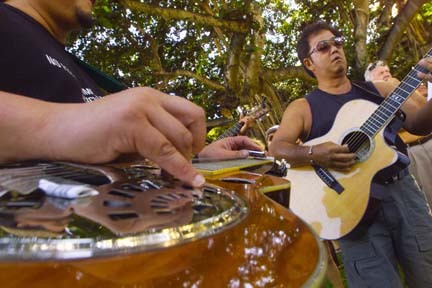 Yesterday's event, the fourth of its kind, brought together people like Wahiawa residents Gordon Freitas, playing a Dobro guitar, and Eddie Lee, playing a regular guitar. Musicians also played banjos, fiddles, mandolins and upright basses.